This is the second in my series of Simple Gifts for the holidays. It's a quickie but goody! 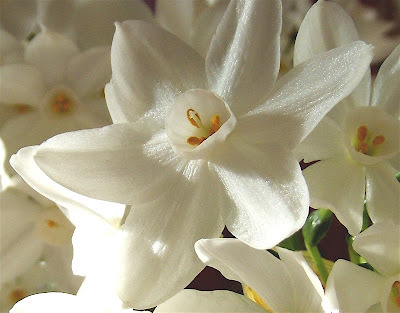 Paper whites are a beautiful flower bulb that you can force to bloom for the holidays. Force sounds so harsh... it just means that you give them a gentle nudge to open early... by giving them the light of a window sill and the warmth of inside. You can do this in any climate, but it's particularly nice where the winters are frosty and you're aching for fresh flowers. I always start mine the week of Thanksgiving. They take 4-6 weeks to bloom. I give them as gifts around the holidays, and by that time they are either just blossoming or about to. Find all of the supplies at your local garden store. Each gift will cost about a $ 1, but be worth so much more! 1. Fill your can half way with gravel or soil. 2. Nestle a bulb in the center, being sure to keep a bit exposed. Green tips to the sky, roots to the bottom. 3. Give it enough water to cover the roots. 4. 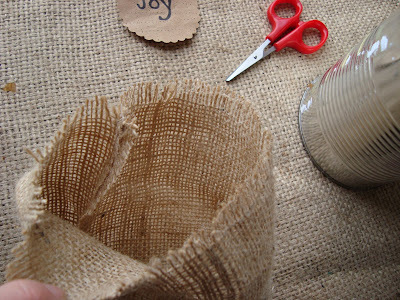 Make a cozy out of a fabric scrap by measuring around your container and adding 1/2 an inch. The height is up to you... let the can peek out or hide it. Stitch the wrong sides together and turn. Fray the top or use pinking shears. I have so many burlap scraps that it seemed an obvious choice. There is no bottom, so just slip it over the can. Voila! 5. Tie a ribbon or twine around the center and attach a gift tag (I snipped mine out of a paper bag) with instructions for care on the back. 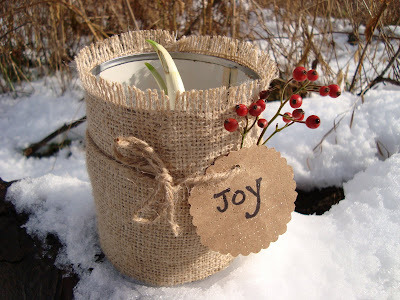 Adorn with a sprig of evergreen or winter berries. Care: Check here for tips. We'll have our windowsills filled with growing paperwhites. My children love watering them and charting their growth. We keep a clipboard and ruler close by. They often grow over night at an amazing rate, so it's very exciting. The gift in the first photo will be going to my Thanksgiving host... I think she's expecting it, so I won't be ruining the surprise by posting it early. Here's what the paperwhites will look like next month! you take lovely pics and do beautiful inspiring things! love it! You are amazing. I love your ideas! Oh I totally love this one! thank you for this wonderful idea! Absolutely love it! This seems like something that would be so much fun for all of us, and doable even with all the craziness at this time of year! Thanks for the tip, and for helping me slow down and remember what's so important about this time of year. I love that you're doing this series and I am definitely bookmarking this project. What a beautiful idea--thanks! I think that I will have to look for different flower bulbs around here. But I will adopt this idea! (I am working slowly on our cascarones, I have to show you!). This is really sweet Maya. You rock absolutely!! 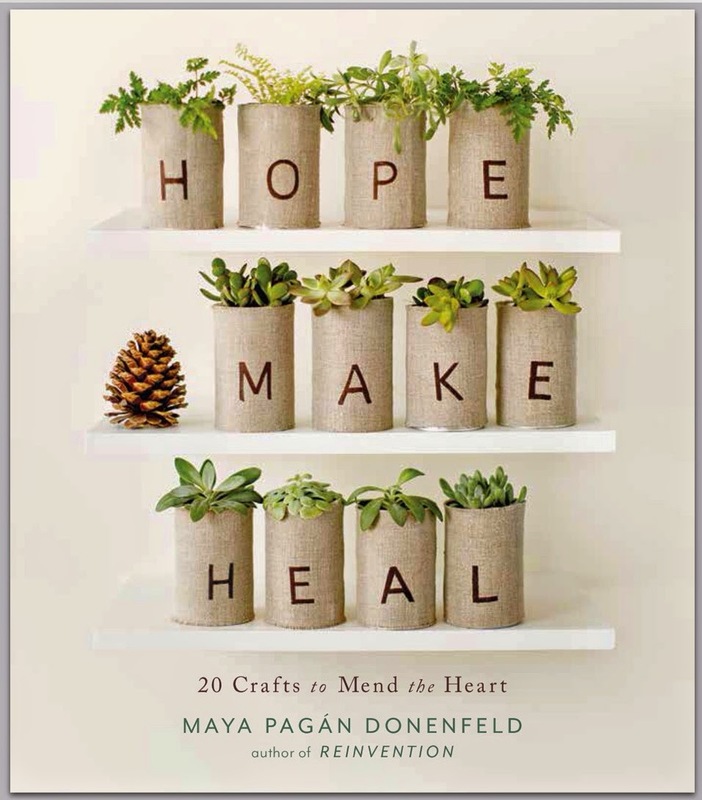 I'm going to buy amarylis this week and start these - fabulous gift ideas! That's a wonderful idea. I may have to use that one. Thanks! very good idea! 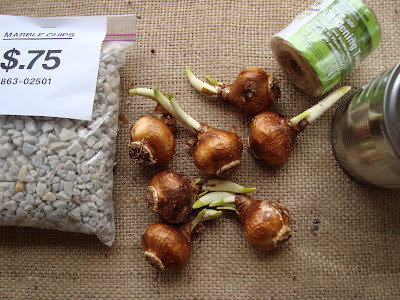 i love forcing bulbs - though it makes me feel a little pushy :) great use of cans too - i go through phases of washing and collecting cans, just waiting for a project idea. Brilliant! 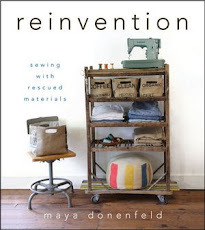 I love the idea of using the recycled can or glass jar. This is so fun! This is a lovely idea for a gift. Thank you! What a lovely gift and idea. I picked up a roll of burlap (nice too) at the thrift store...hummm??? such a fabulous gift idea!!! We like to plant an amaryllis around Christmastime. I like your burlap wrap around the can. I just discovered your blog a few weeks ago, and am so excited about/inspired by all your wonderful ideas. I've been stewing for weeks on what to give everyone at my office and wanted to make something this year--simple, thoughtful. this is perfect! I'm going to do the paperwhites with my two children and give them to all my coworkers. This is FABULOUS! I'm going to make these for everyone! Thanks tons! I'll be linking as well. i stumbled across a great find with your blog. can't wait to read more. Yeah! So happy many of you will be giving paperwhites. There can never be too many flowers! Wow, what a wonderful gift. Thankyou for the inspiration, I did this for a present for a friend today and she loved it. I am a relatively new follower of your blog and I just wanted to say thankyou for all that you share. I love this idea. I live in the northeast and am hosting a craft party for about 30 kids. 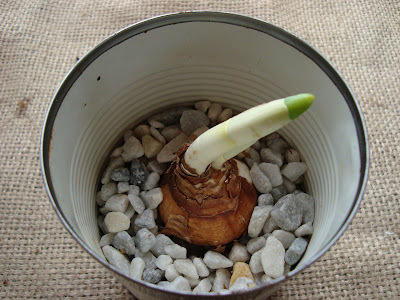 Where do you recommend that I buy paperwhites or amaryllis in bulk?